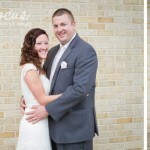 This lovely couple ventured all the way from Colorado for their wedding in Spencer’s hometown of Waterloo, IA. I can’t imagine planning a wedding across the country, but they pulled it off and it turned out to be a beautiful celebration on a beautiful day in June. 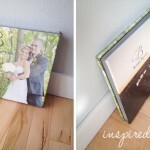 It was such a joy to be a part of all the details of the day with my second photographer, Nichole of Inspired Images. Some favorite moments throughout the day: At Hot Heads salon, Karen discussed with her girls all the specific places she needed to be during the ceremony. A flower garden just outside the church provided the perfect setting for their first look. Spencer came up with the idea of doing something a little extra and created a fun surprise by giving Karen a lovely bouquet of roses. As she and Spencer knelt at the altar during the ceremony, Karen sang throughout the service and knew all the songs by memory. You could tell it was a meaningful worship experience for both of them. I loved all the special moments and genuine love expressed between family and friends. It was definitely apparent that these two are supported by many because of all the loved ones who came out to be a part of their special day. 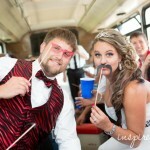 Congratulations Karen & Spencer on your new life as a married couple! May you have many more wonderful experiences to come on the exciting journey ahead! What a great day for all of us to be a part of! Thank you Anna for capturing it so brilliantly! © Inspired Focus Photo & Design|ProPhoto Photography Template by NetRivet, Inc.